We’re 3 days from leaving and 4 days from the expedition launch. We FINALLY have everything we need and I’m almost done cramming everything into three suitcases. I managed to fit all of our camp gear into one bag, mostly due to the fact that it’s only a two-day trip so we don’t need any cooking supplies. 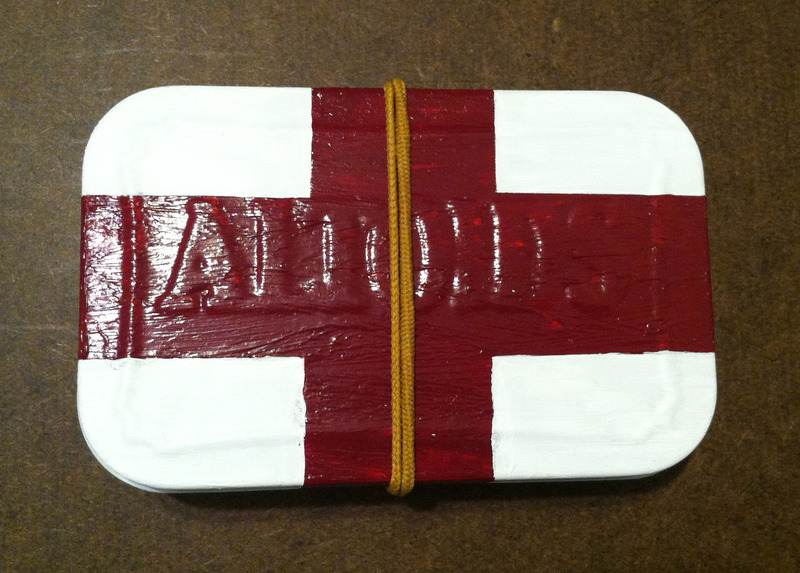 Among all the camping and hiking gear are three kits made from Altoids cans. 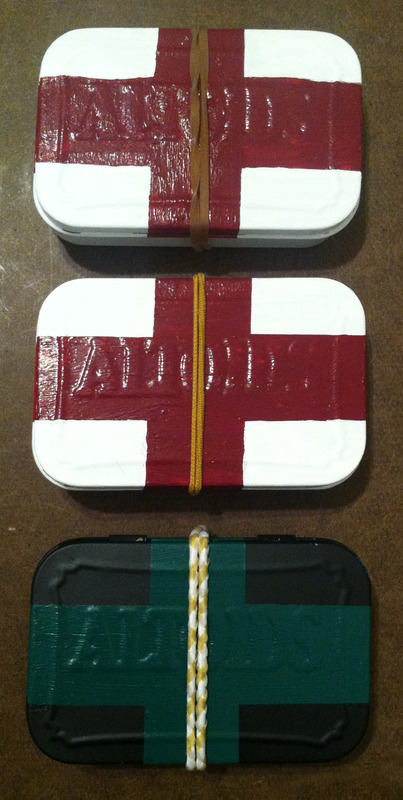 I made two first aid kits, one that is airplane/TSA safe, one that is not, and one emergency survival kit. 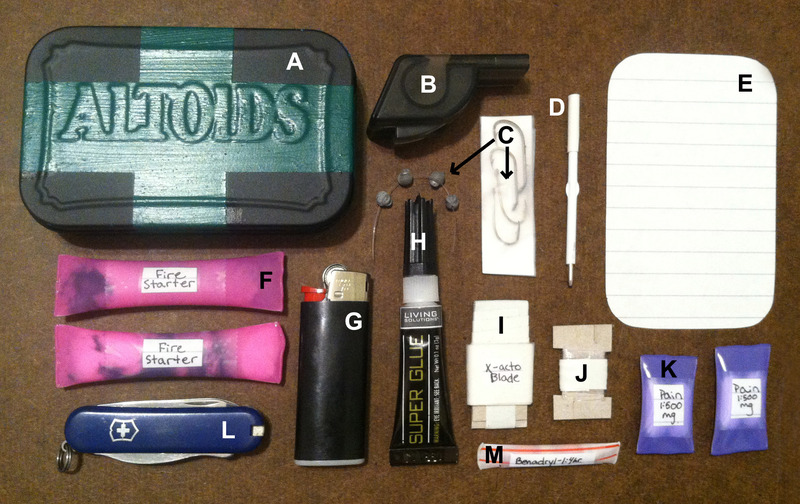 The first kit I’ll focus on is the TSA-safe kit. 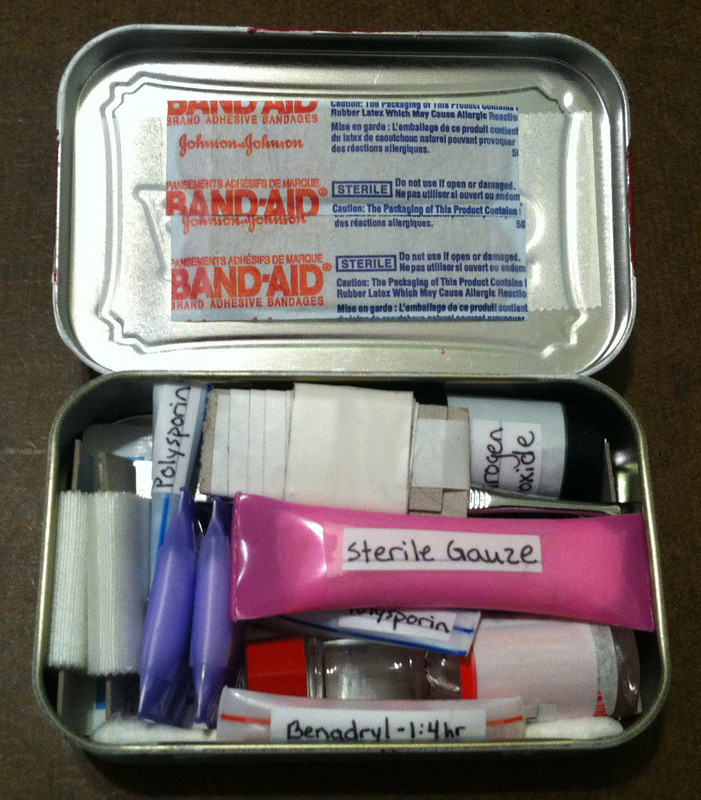 I like to be prepared, so I wanted some first aid supplies to put in my carry-on. 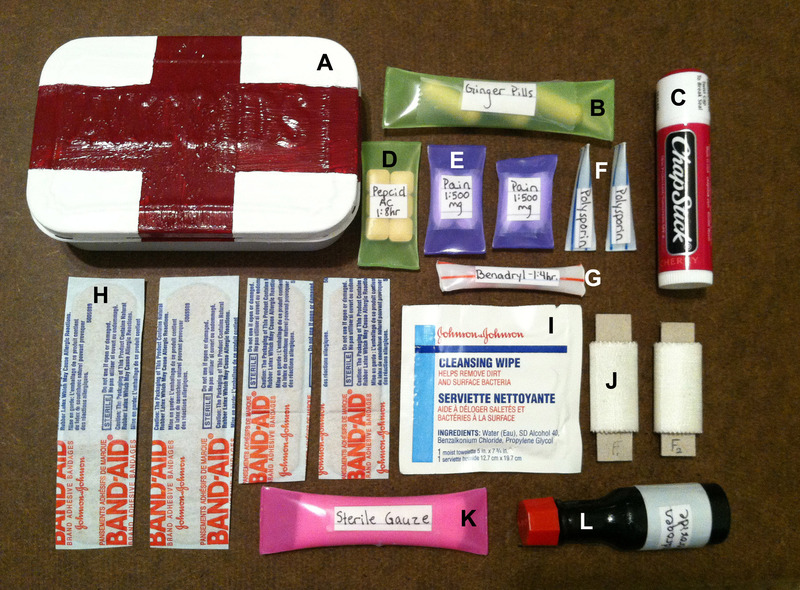 The second first aid kit is not so airplane friendly, though it contains many of the same items as the TSA-safe kit. 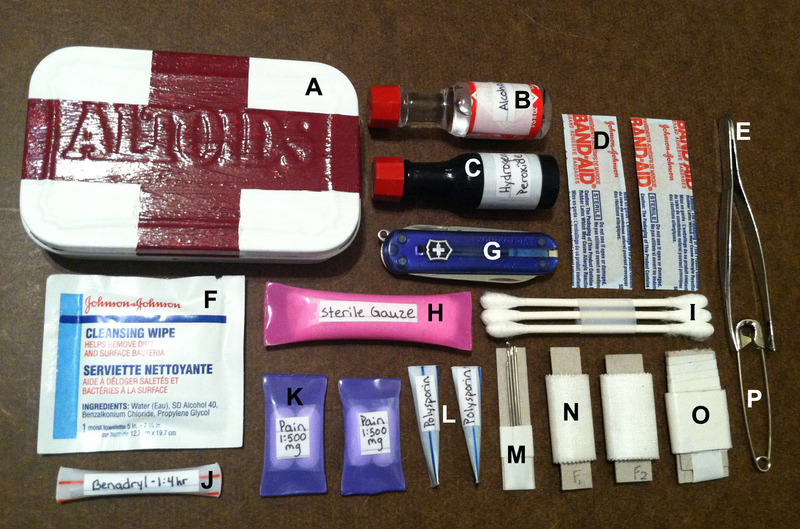 Lastly, I prepared an emergency survival kit, which is also not airplane-safe. For the little pill cases, the gauze, and the firestarters, I used the really wide straws that come in the frozen drinks at Panera. Pinch together one end of the straw with needle nose pliers and melt it together with a lighter. It only takes a second. Fill it up with whatever you want and then pinch the other end closed and melt it together, also. For the Benadryl and polysporin I used common household straws, though I would’ve preferred ones from McDonalds because they are a little wider. You can also coat the ends of Q-tips in burn cream, polysporin, antibiotics, or whatever you think you may need, cut a straw to fit the length (plus a little to pinch and melt), and seal them up for some ready-made applicators. The firestarters are a recipe I found on a lot of different blogs and then tweaked to get the longest burn-time possible. After sealing one end of a Panera straw, tear one cotton ball into a few pieces. Place half a dryer sheet on a flat surface you won’t mind getting Vaseline all over. Roll a piece of the cotton ball in Vaseline and place it along one edge of the dryer sheet. Repeat this process until you have a line of cotton ball and dryer lint all along the side of the dryer sheet. 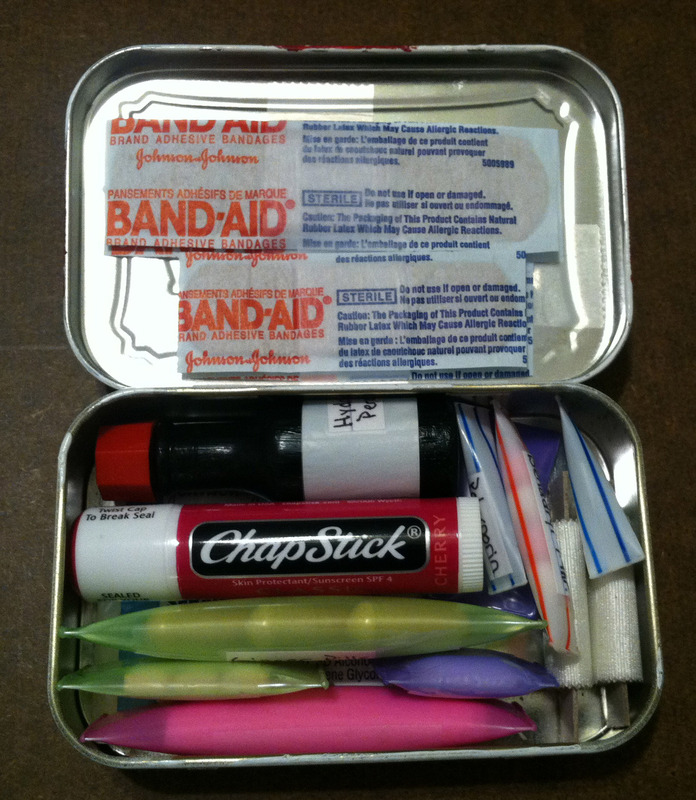 Cut small chunks of chapstick off and place them next to the line of cotton and lint. Then roll the dryer sheet tightly around the flammable material, insert into the straw, and seal the other end. To use, cut or break the straw open across the middle, place among your tinder, and light. You should get about 15-20 minutes burn time, more than enough to catch a fire. For the polysporin I found it easiest to cut a straw segment, and leave both ends unsealed while filling. Don’t over-fill, then carefully seal both ends with a lighter. The tiny bottles of rubbing alcohol and hydrogen peroxide are VERY well cleaned, miniature bottles of tabasco sauce I got from the hotel I work at. Fill them with an eye-dropper or medicine syringe (the kind without a needle). I painted the hydrogen peroxide ones black with acrylic paint because hydrogen peroxide becomes inactive when exposed to light. Tip: Paint them AFTER filling. It is far too difficult to try and fill a teeny tiny bottle via syringe when you can’t even see how much you’ve put in already. I decided not to pack any thread, as fishing line can be used to temporarily mend rips and tears, and also works better than any fibrous material to seal any deep wounds. I prepared these kits based on my needs, the length of the trip, and the climate and environment in which we’d be living. These work for us, but you should tailor your kits to fit your needs and environment. UP NEXT: Tyler and Tawnya survive the airport, extended plane rides, and excruciatingly boring layovers. Every year, my father’s work goes on a week-long business vacation in really great places. Last year was the Virgin Islands, the year before was Ireland. 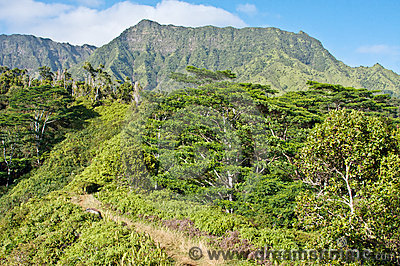 This year is Kauai, Hawaii and the entire family is going. 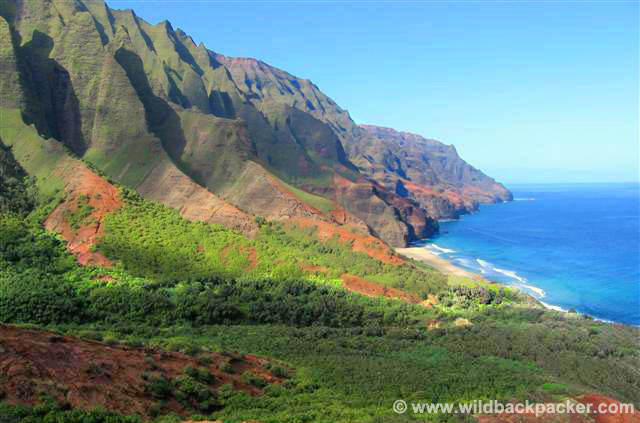 Then we read about the Kalalau Trail, which leads to the secluded Kalalau Beach along the Na’Pali Coast. You can only reach this beach via a rigorous kayak adventure, or the 11 mile out-and-back hike (22mi round trip). 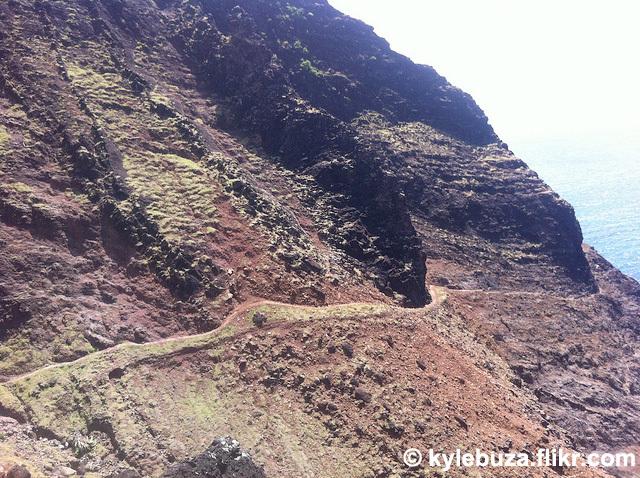 Of course, being only mildly experienced hikers, but always looking for a challenging adventure and a great story, we chose to spend the first two days of our Kauai vacation roughing it on one of the 10 most dangerous trails in America according to Backpacker Magazine. The total elevation gain/los for this trail is about 5,000 ft total, we’ll encounter tons of waterfalls, and eventually have to traverse Crawler’s Ledge, a path barely 12in from a 300ft drop to the crashing surf below. We plan to do the hike in two days, first day out, second day back. The fact that we’re coming from Missouri means we’ll have to pack extremely light, making our backpacking trip an ultralight advendure. 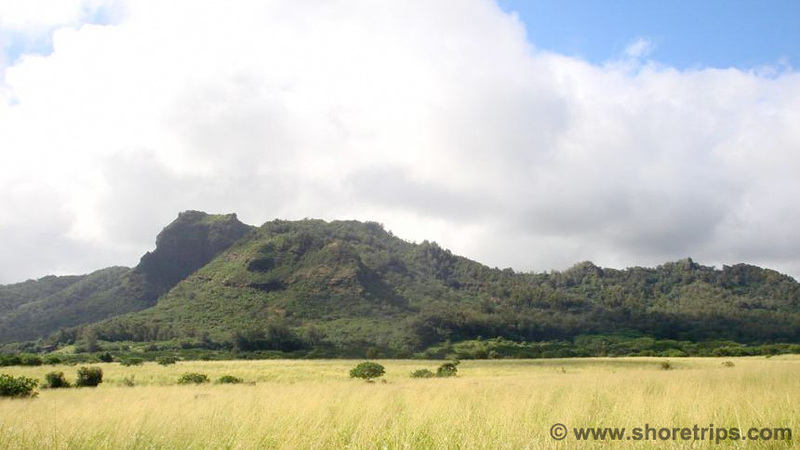 Not being extremely experienced, I frequently look at other traveler’s blogs to get information about what and how to pack, what kind of food to bring, planning a trip, and safety on the trail to make our trip enjoyable. I haven’t really found one person that has all the information I’d like or all the photos I want to see. Over the next week, I’ll post detailed entries about our packing process and preparation.